(NaturalNews) No matter what junk science the global corporations are trying to push, there's always a long list of scientists, doctors and journalists ready to accept some payola money to spread their propaganda. The latest example comes from the Coca-Cola company, which paid "fitness and nutrition experts" to place pro-Coke articles in over 1,000 news websites (including major newspapers) to position Coca-Cola as a "healthy snack." Yep, if you think drinking Coca-Cola with all its genetically modified high fructose corn syrup isn't incredibly healthy, then you're "anti-science" because you're opposed to the twisted quack science the corporations are pushing through payola schemes that place their propaganda on willing mainstream media websites. To her credit, Associated Press writer Candice Choi wrote a very informative article on this, exposing ethics violations that are abundantly obvious in such "payola journalism" deals. Now, it's one thing to ethically promote truly healthful solutions that benefit readers. After all, I sometimes announce new superfood products here on Natural News, fully disclosing why these products are cleaner (heavy metals lab testing, for example) and explaining that they are available at the Natural News Store. That's honest news about a new solution that benefits people. But to accept money to promote something that causes diabetes, obesity and kidney stones is another matter entirely. Coca-Cola soft drinks directly contribute to serious chronic diseases that destroy lives and cause enormous suffering. Accepting money to push Coke as a "healthy snack" is not just highly unethical, it's also a blatant sellout to corporations whose products contribute to disease. And look who's doing it, too: A registered dietician in a Chicago bilingual newspaper wrote this Coca-Cola propaganda piece entitled, "Ideas to Score a Touchdown during the Super Bowl without Sacrificing the Diet." The article suggests that Hispanics -- who already suffer horrendous rates of type-2 diabetes -- should "drink a mini Coke can with mini sliders." The writer, not surprisingly, is a paid propagandist who also produces corporate communications for Kellogg's and other companies. Similarly, this piece on Patch.com promises "Heart Health Month Snacking & Exercise Tips." What it actually offers is lines like "...look for a refreshing beverage option such as a mini can of Coca-Cola." The author is described as "...a Personal Trainer and Sports Nutritionist who helps individuals, businesses including The Coca-Cola Company and organizations develop a culture of wellness..."
Seriously? Coca-Cola can be mentioned in the same sentence as "a culture of wellness?" Why not just sign up to get paid by Big Tobacco to promote "cigarette wellness programs that help people 'balance' the nicotine in their lives"? For the record, a mini-Coke "...is 7.5 ounces and has 90 calories, all of it from high-fructose corn syrup," reports the AP. It also contains phosphoric acid. The HFCS comes from genetically engineered corn. There is nothing whatsoever about this product that even approaches the concept of "wellness." Code words for corporate shills and propaganda hacks: These "opinions are my own"
Whether you're dealing with biotech corporate shills (paid professional "science liars"), fluoride poison pushers or Coca-Cola propagandists, a key phrase that helps identify these sleight-of-mouth word twisters is "these opinions are my own." I remember reading an email written by Jon Entine, the discredited GMO propagandist who Forbes.com recently cut off from publishing fabricated articles on the Forbes website. In an email, he aggressively insisted "the opinions are my own," claiming he had no direct ties to biotech companies. The health experts who wrote the pieces mentioning Coke stand by their recommendations. Robyn Flipse, the dietitian who wrote the sponsored article for Coke, said she would suggest mini-cans of Coke even if she wasn't being paid. 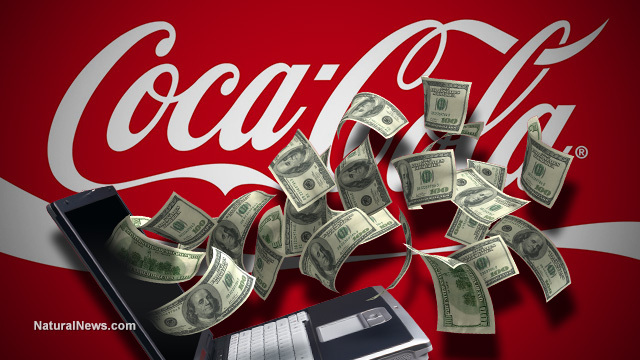 Coca-Cola's payola scheme is far bigger than just a few sellout bloggers and writers who plug Coke for money. "We have a network of dietitians we work with," Coca-Cola spokesperson Ben Sheidler told the Associated Press. And how does Ben defend the practice? "Every big brand works with bloggers or has paid talent." Wow. It's okay because all the other corporations are doing it too, apparently. "Paid talent," of course, refers to writers, bloggers, scientists and journalists who take money to spread corporate propaganda. There are hoards of 'em. You'd be shocked to learn just how many stories that appear in the media contain plugs for toxic corporate products, covertly placed inside articles to make them appear like they aren't blatant ads. One column is marked at the bottom as a "sponsored article," which is an ad designed to look like a regular story. It ran on more than 1,000 sites, including those of major news outlets around the country. The other posts were not marked as sponsored content, but follow a similar format. "Major news outlets", in other words, are secretly running corporate advertisements disguised as news. It makes me wonder: how many news organizations took money from Big Pharma to censor the truth about the CDC's vaccine science fraud whistleblower? How many got paid to falsely claim all vaccines are safe and effective? How much money does the biotech industry spend to buy fabricated articles in the mainstream media or pay off "scientists" to claim the GMO science is "settled"? The even bigger story here is one you may not have thought of: How many so-called "alternative" websites took grant money from the Bill & Melinda Gates Foundation and then suddenly started promoting GMOs and vaccines? Look around... there are far more of these than you might realize. Finally, when you look at the so-called "news" on the web these days, keep your Spidey sense on high alert. Almost every pro-corporation message is a paid content piece... either directly paid as payola or indirectly paid through advertising that funds the site. Notice that Natural News accepts no advertising from drug companies, big food companies and the biotech industry. If Bill & Melinda Gates sent me a check for $10 million to "invest" in Natural News, I would reject it and send it back. Real journalism can never be honestly pursued by any news organization that is wholly compromised by corporate money. The only truly honest news you'll get comes from small, independent operations run by real people who have a strong internal code of ethics that rejects corporate sellouts and financial infiltration.